You need a set of bathroom scales in order to regularly track your weight and ensure it doesn’t begin to creep up to unhealthy levels. Modern scales do a lot more than just measure how much you weigh; they look at body fat %, water %, metabolic age, visceral fat % and much more. Then you have the new breed of Wi-Fi connected scales. These devices allow you to upload your results to an online account and track your progress with the aid of cool visuals such as graphs. There is something extremely satisfying about watching your body fat % tumble in the form of a line graph. What Can Wi-Fi Scales Actually Do? Smart home devices are threatening to take over the market so it’s hardly a surprise to see bathroom scale manufacturers joining the party. In essence, a Wi-Fi scale can provide you with a clear overview of your health without you having to do much besides stepping on and off the scale. Obviously, you’ll need to do more than that if you want to reduce your body fat %! Assuming you have wireless Internet in the home, you can quickly connect it to your bathroom scales. The next step is to create an online account. When you step on the scales, your results are sent directly to this account where you can access them at any time. Most companies enable you to create graphs and charts of your progress for a fascinating look at your progress. A high number of Wi-Fi bathroom scales are also compatible with fitness trackers and you can use a single app to access data from both devices. Smart scales can also automatically tell the difference between users based on previous weigh-ins so all members of your family can privately keep track of their individual data. When the time comes for your next physical, you can show your doctor the results! The days of tracking your weight with pen and paper are long gone! In terms of metrics, high level Wi-Fi scales measure weight, body fat %, water weight %, bone mass, muscle mass, metabolic age, visceral fat and much more. You can separate all this information in your online account to alleviate confusion. Why Should I Invest in Wi-Fi Scales? While it’s true that Wi-Fi technology can’t lose the weight for you, it is more likely to push you in the right direction. If you don’t have any means of measuring your weight loss, how can you possibly expect to succeed? The weight loss process is difficult for most people; otherwise the vast majority of us would be slim! We live in a world of convenience which has led to an explosion in the availability of low quality fast food. The accompanying drop in price has only led to an increase in consumption and now the United States is in the midst of an obesity epidemic. Although it depends on your personality, most people do better when they have a support system (family and friends) and when they have an accurate means of gauging their progress. Wi-Fi scales can measure almost every conceivable metric (including a number of irrelevant measurements) and give you a clear overview of how your fat loss efforts are faring. If you get off to a good start (as most people do), you are immediately encouraged by the visual data which outlines the drop in body fat and overall weight. Having this information to hand makes you more likely to continue on the right path. Although this product has been on the market for a while, it has still managed to hang on to the ‘King of the Wi-Fi scale’ crown. It enables you to track your weight, body fat % and BMI online and allows for automatic uploading of stats to an online account. All you need to do is log in to see your statistics in graph form. The Aria is relatively easy to set up provided you have a reliable connection and it recognizes up to 8 users. Every account is password protected so your information is safe. We love the convenience of this Wi-Fi scale as it is compatible with any FitBit tracker including the FitBit Surge and FitBit Charge HR. Although it is expensive, the Aria also happens to be one of Amazon.com’s bestsellers. The excellent technology provided by this scale enables you to sync your results with a Smartphone. When you weigh yourself, it’s possible to scan the bar code that appears in order to track your results. You can install the Weight Guru app on your phone and the scale retains the information of up to 8 people. It integrates with a host of popular apps including Google Fit, Apple’s Health App and FitBit. This smart scale also displays your body composition measurements on the screen after every weigh-in. It measures body fat %, bone mass, lean body weight and water weight. The LCD screen is extremely large and the scale has a capacity of 400 pounds. The 5 year warranty offered by Greater Goods, is to our knowledge, the longest warranty of any Wi-Fi scale. It is easy to connect and is reasonably priced. Withings is a popular brand and its WS50 model is a major seller on Amazon.com. Unlike other scales, you can pick your body type before weighing yourself in order to get more accurate results. It also offers Wi-Fi and Bluetooth connection options. The accompanying Health Mate App enables you to track calorie intake and visualize improvements and trends during your weight loss regime. We also liked the scale interface design which helps you ‘center’ on the scale; this is supposed to provide you with more accurate readings. It syncs your fat composition, heart rate, weight and environment data and we found it fairly easy to connect. Although the weight measurement is very accurate, the more unusual metrics such as room air quality and heart rate monitor don’t seem to work very well. As good as this Wi-Fi scale is, removing some of these unnecessary measurements would improve it as well as reducing the hefty price tag. Depending on the model you choose, your scale will have Wi-Fi or Bluetooth although a few will have both. Wi-Fi scales tend to be more expensive because more components are required in order to it to work; it is also more convenient than its Bluetooth counterpart. For example, Bluetooth won’t transfer data when you’re more than 30 feet away from your router whereas Wi-Fi usually works up to 100 feet away. If you want to get your readings transferred to the tracking app using Bluetooth, the Bluetooth device has to be beside you. In contrast, a Wi-Fi scale will sync your data provided there is a decent signal coming from your router. Wi-Fi syncing also tends to be far more reliable as Bluetooth syncing has a tendency to fail on occasion. Connection: A Wi-Fi scale is pretty useless if it doesn’t connect properly. We’ve looked at a variety of scales that have caused frustration for users due to a difficult set-up. 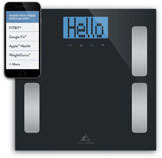 Look through our reviews and those of customers on Amazon.com to find Wi-Fi scales that are easy to set up. Accuracy: All the hi-tech gadgetry in the world means nothing if the scales don’t do the job they are supposed to! Again, look at reviews to gauge the accuracy of different brands. Using a reliable scale in your primary care physician’s office can give you a good idea of your actual weight. Metrics: What do you need the scale for? If you’re only interested in your body fat % and weight, there is no need to spend a small fortune on a device that gives you all the measurements under the sun. Online Account: What can you actually do on the online account? Is it easy to set one up? The best Wi-Fi scales allow you to create graphs and charts that outline your progress and you can keep this information private or share it with the world. Price: Wi-Fi technology doesn’t come cheap but if you shop around, you’ll find significant discrepancies between the costs of various scales. Just because a scale is very expensive doesn’t mean it’s the best on the market. Wi-Fi scales have changed the way people weigh themselves. Instead of stepping on an old-fashioned scale and getting a number that doesn’t mean a great deal, you can benefit from a wide range of data that offers a better look at your health. Then you can upload everything to an online account where it can be accessed 24/7. There’s no need to take down notes and you benefit from a clear outline of how you’re progressing. Seeing this information in visual form can really motivate you and keep you on the fit and healthy path.